Former Governor Terry Branstad is crying foul over an ad campaign that’s attacking his 16-year record as governor. “It is, again, taking some things out of context and not pointing out the fact that when I was governor we cut taxes and we restored fiscal responsibility and we got the budget balanced for the first time on generally accepted accounting principles,” Branstad says. Inside of mailer that attacks Branstad's record. According to Branstad, the group’s ads are a signal Democrats believe he is the only candidate who can beat the incumbent Democratic governor. Branstad is demanding that the group attacking his record reveal who has contributed to the effort, but the next disclosure report isn’t due ’til after the June 8th primary. 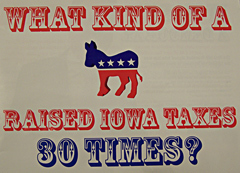 “Iowans for Responsible Government” operates under tax rules for groups that are formed “for the purpose of influencing the selection” of candidates for public office.